Use this page to order a prewired PRS assembly. Select from the options below and then add the assembly to your basket. You will find information about each option is at the bottom of the page. The initial price of every prewired assembly is $0, but after you add it your basket the actual price will be calculated. You can view the total price by viewing your basket contents. Listen to these sound samples of a VT-ST harness installed into a PRS McCarty Trem with stock McCarty pickups. All samples were performed and recorded by yours truly, Andy Rothstein in my home studio. I am playing through an early 1970's Marshall Super Lead. SRV STYLE (TAPPED) - This sample really demonstrates the Fender like "quack" you can get with the hum-cancelling "smart tap" used on the VS-ST harness. I am playing a SRV style fast blues improv. Both the rhythm and lead guitar parts are using the middle position with the coil tap engaged. ROCK RIFF WITH SOLO - This second sample is a basic improvised rock vamp. The rhythm guitar is playing in the middle position (un-tapped) and the solo guitar is playing the bridge pickup (un-tapped). Master Volume, Master tone and 3 way selector switch. Includes coil-tap on the tone pot. VT-ST: Standard with Smart Coil-Tap RECOMMENDED! Master Volume, Master tone and 3 way selector switch. Includes what we like to call a Smart coil-tap. This is an upgrade to stock wiring and you can read about it below. This is the model we are using in the sound samples above. Master Volume, Master tone and 3 way selector switch. No coil tap on this model. This is a good choice if you don't care for the coil tap option. This is your only choice if you will be using pickups only available in 2 conductor such as Fralin P92's. Assuming you have a PRS® at home with either stock wiring, or an upgrade kit from another vendor try the following experiment. First, set your amp reasonably loud and preferably with some gain. Use the 3 way selector switch to select your bridge pickup, then engage the coil-tap by pulling up on the push-pull pot. As expected, you will notice 60-cycle hum. This is totally normal, and to be expected. Cool. Now, disengage the coil-tap by pushing down on the tone pot. Next, select your neck pickup and do the same thing (that is, lift the push-pull pot). Again, you will notice the same 60-cycle hum. Again, this is totally normal, and to be expected. OK, so where is the problem? Now, put your 3-way switch in the MIDDLE POSITION, and engage the coil-tap by pulling-up on the push-pull pot. What do you hear? You hear pretty loud 60-Cycle Hum. That is what we believe to be a problem.There is absolutely no reason to hear 60-cycle hum when the coil-tap is engaged and both pickups are selected via the 3-way switch. The problem is that the coil-tap on stock wiring is shorting coils of the same polarity on each pickup (assuming you are using pickups from the same manufacturer). In other words, when tapped you are listening to two NORTH coils (one from the bridge and one from the neck), or two SOUTH coils (one from the bridge and one from the neck) simultaneously and naturally the resulting sound is not hum-cancelling. FYI, the reason we specify either two north, or two south coils, is because this depends on which brand of pickups you are using. The Rothstein wiring for PRS corrects this problem by using what we like to call a "Smart Tap" system. The Smart Tap system will short the NORTH coil from one pickup with the SOUTH coil from the other pickup so the resulting sound will still be hum-canceling when both pickups are selected via the 3-way selector switch. For example, when implemented with Lindy Fralin humbuckers (or unbuckers), when tapped the slug coil of the bridge pickup is left "live" with the screw coil of the neck pickup. The resulting combination is still hum-canceling! SBE Orange Drop capacitors will be used at no extra charge, or for an upcharge you may select between a variety of caps including Alessandro High End vintage repro wax and paper capacitors, Vitamin Q Paper & Oil capacitors, and the ultra high quality V-Cap TFTF Teflon� Film and Foil capacitors. The price will vary depending upon which capacitor you select. Read about capacitor choices here. 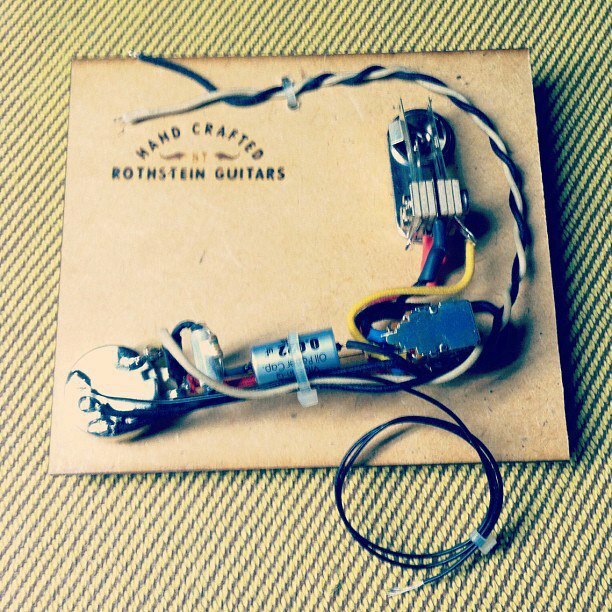 A volume kit (also know as a "treble retention circuit" or "high-pass filter") is used to prevent the loss of highs associated with lowering the volume on your guitar. We use a 1000 pf Mallory 150 Series Metalized Polyester Tubular capacitor in parallel with a 150K resistor. WILL IT FIT WITHOUT MODIFICATION? SWITCH HOLE: If your guitar currently has a rotary switch, ou will need to enlarge the rotary switch hole to 1/2" for the toggle switch to fit. This is a safe procedure, and we recommend using a tapered reamer and NOT a power-tool such as a drill or dremel. POT HOLES: If you have an import PRS, those models use the cheaper metric pots, and therefore have corresponding holes drilled for the metric pots.These holes will be too small for the 3/8" diameter pots provided with your Rothstein kit and your existing holes will therefore need to be enlarged to 3/8" to fit properly. KNOBS: If you have an import PRS with metric pots, your existing knobs will not fit on our pots. You may purchase knobs from us as indicated above. If ordering VT-ST or VT-T models, you must verify that you have either 4 conductor pickups (or at least 3 conductor as some manufacturers offer this option including Lindy Fralin). What are "coil-split" wires / aka coil-tap wires (for example, with DiMarzio pickups, these will be the black and white wires). You may refer to our humbucker color code chart here, and there are many others posted on the internet. Note: If you plan on using PRS pickups, the process of determining the color codes might be a bit fmore confusing, as you will find variations on the color coding scheme depending on which pickups you have. Some of their pickups are 4 conductor, others 3, and on some models you need to reverse hot and ground on the neck vs. bridge pickup. The best thing to do is look at your current circuit, and see which wire is used as hot, ground and tap currently. Either way, you should determine points 1 - 3 above before placing your order. The best things in life are worth waiting for. Each assembly is wired and tested one at a time to your specs by hand. Our services have been getting quite popular lately, and our current lead time is listed in the universal header of the site. That being said, we always shoot to get your order out as quickly as possible.